Several inmates allegedly involved in the "sickening" ambush of a Rikers Island guard, a brutal attack that left him with a fractured spine and brain bleeding over the weekend, are expected to be arraigned on various charges Monday. Gus Rosendale reports. 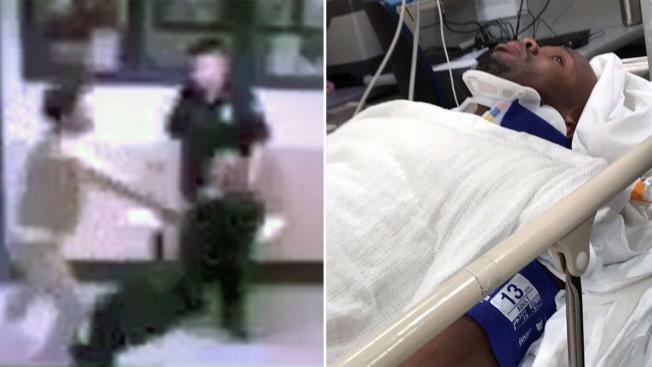 Several inmates allegedly involved in the "sickening" ambush of a Rikers Island guard, a brutal attack that left him with a fractured spine and brain bleeding over the weekend, are expected to be arraigned on various charges Monday. 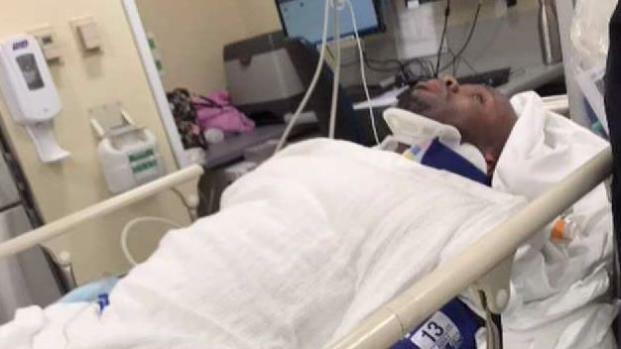 The 39-year-old correctional officer, Jean Souffrant, was attacked at George Motchan Detention Center around 6:30 p.m. Saturday, union sources said. The jail is scheduled to close this year as part of a plan to close the troubled complex. The officer's spine was fractured in his neck region and he suffered bleeding in the brain. He remained hospitalized in stable condition days after the attack, which was caught by surveillance cameras. Those cameras show an inmate first punch the officer in the face, then a group of inmates start kicking and punching him on the ground. Other officers pepper-spray them. The inmate who allegedly threw the first punch, Steven Espinal, has a lengthy rap sheet including charges of attempted murder and assaulting an officer. He along with three others -- Samson Walston, Nazeem Francis and David Burns, all younger than 21 -- were arraigned Monday. All four suspects pleaded not guilty. Attorney information for them wasn't immediately available, nor was it clear which charges they would face in connection with the ambush. A group of corrections officers appeared in court on Monday to watch several Rikers inmates being arraigned for an attack on a fellow officer that saw him hospitalized with a broken spine. The president of the union, Elias Husamudeen, that represents guards said Rikers has a gang problem. He said the inmate had previously threatened to punch the officer, and allegedly had a beef with Souffrant after he wrote up the inmate for having a window covering in his cell. Husamudeen held Mayor de Blasio responsible for the attack and also pointed out the mayor ended solitary confinement for inmates 21 and younger a few years ago, which allowed for the suspects in Souffrant's attack to be in the general population in the first place. The union opposes the new solitary confinement policy. Husamudeen also said he wants the Department of Justice to investigate the gangs at Rikers. De Blasio spoke to the officer and would get to the bottom of the "heinous attack," press secretary Eric Phillips said in a tweet. A number of Souffrant's fellow correction officers filed into the courtroom for the hearings Monday. City officials expressed horror at the attack. "What happened to our brother last night at the hands of a violent group of cowardly inmates was sickening," Corrections Commissioner Cynthia Brann said Sunday. "They'll be held accountable for this crime, but right now our thoughts and concerns are with our hospitalized officer and his family." She said an investigation is underway and anyone involved would be arrested. Correctional officers "have one of the hardest jobs in city government - often thankless and always dangerous," he tweeted. The victim's cousin, Gui Souffrant, told NBC 4 New York that he had worked as a prison guard for two years. He has a masters degree from Haiti and is married, Souffrant said. A corrections officer at Rikers Island in New York was attacked by inmates, who knocked him out and broke his spine. This video, provided by a Corrections Department source, shows the attack.